This truly divine, unique red flower offers an incredible phyto-active profile in our NATIVE EXTRACTS water- soluble range and for those wanting new sources of oil-soluble activity, you now have access to this uniquely Australian oi-infusion. Be the first to work with the iconic Australian Rosella Flower infused in Australian grown and cold pressed Sunflower Oil, high in Oleic Acid. This oil can act as a partitioning agent cutting through the skin barrier, moisturising and nourishing the skin as well as having the potential to assist absorption of other oil-soluble ingredients. Create new brand differentiation and imagery with this beautiful uniquely Australian flower infusion. A new alternative to regular carrier oils from the pristine mega-diversity of Australia. 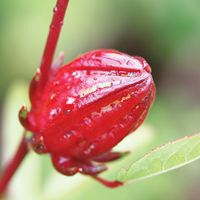 Also discover the NE Rosella Extract from our water-soluble range and discover the 'True to Nature' water- soluble blueprint this exciting flower has to offer. Now you can layer your products with both water and oil-soluble benefits from the one species. Adjuvant treatment for acne, less tendency to block pores. Maceration of the herb infused into Cold Pressed Oil. Vegetal Extract obtained after the extraction of the substance at low temperature with Vetetable Oil.